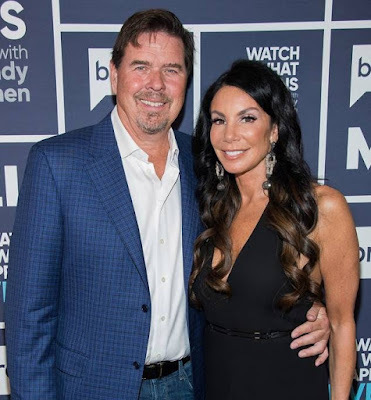 iRealHousewives | The 411 On American + International Real Housewives: Danielle Staub Gets Married In The Bahamas To Fiancé Marty Caffrey! Danielle Staub Gets Married In The Bahamas To Fiancé Marty Caffrey! Danielle Staub is officially married! The Real Housewives of New Jersey star walked down the aisle on Saturday, marrying her fiancé Marty Caffrey in a sunset bohemian beach ceremony held on the Bahamas’ North Bimini Island at the Luna Beach Club, reports PEOPLE. Among the family and friends at the festivities were Staub’s two daughters: Christine, 24, and Jillian, 19. Also in attendance were her co-stars Teresa Giudice, Melissa Gorga and Margaret Josephs — each wearing pink and serving as bridesmaids for the event. A source confirms to the publication that the occasion was filmed for the hit Bravo show’s upcoming ninth season. All were barefoot for the ceremony, though footwear was worn at the reception, where the guests dined and danced the remainder of the night away. A rep for Kleinfeld told E! News, "Danielle shopped at Kleinfeld in NYC for her Pnina Tornai dress and her bridesmaids wore dresses from our new bridesmaid company, Kleinfeld Bridal Party." Staub admitted she was a “little nervous” just a few hours before the nuptials as a stream of visitors came by. “All my family, my friends, everyone’s checking in with me, and I’m like, ‘Guys, I haven’t showered, I still haven’t showered, and I’m getting married today,'” she told Us Weekly.